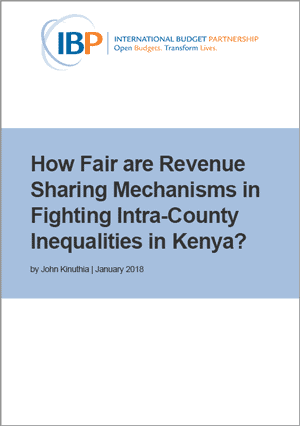 How Fair are Revenue Sharing Mechanisms in Fighting Intra-County Inequalities in Kenya? Kenya’s latest attempt at devolution, as enshrined in the 2010 constitution, aspires to a rigorous, transparent, and equitable approach to sharing resources across the country based on a national revenue sharing formula. While discussions of equity and marginalization in Kenya have traditionally focused on revenue sharing among counties, data from the Kenya National Bureau of Statistics and the Society for International Development shows that inequalities are just as severe below the county level. This paper looks at several approaches Kenya counties have taken to distribute resources through their budgets to determine if these approaches address intra-county inequalities.